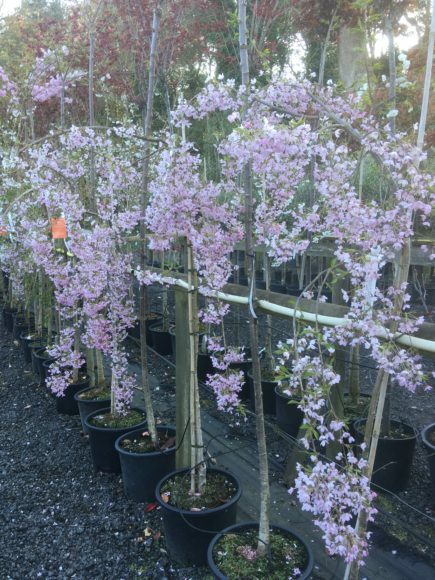 Here at Arundel Arboretum, a tree nursery in Sussex, Ornamental cherry (Prunus) trees are an extremely popular tree for spring interest. They are an attractive and versatile tree and especially colourful in spring when they are in full blossom. There are so many varieties to choose from giving a display of white, pink or even red flowers. Flowers can be single, semi-double or double. Many also have the benefit of spectacular autumn colour. Most flowering cherry trees are particularly hardy and disease resistant. They can also tolerate poor soil conditions, including clay and some chalk soils. It is always wise to check your soil and the tree you would like before purchasing to make sure it will thrive in your conditions. Prunus ‘The Bride’ is a small, deciduous tree with a rounded growth habit. In spring, it is massed with pure white single flowers that have a deep red centre. It can be planted in full sun, in a sheltered or exposed position. Prunus ‘The Bride’ has an eventual height and spread of 4m-8m. Prunus incisa ‘Kojo-no-mai’ is a delightful, deciduous shrub. It has single, stunning white flowers with pink centres in spring, followed by mid green leaves on its zig-zag array of branches. It can be planted in full sun, in a sheltered or exposed position. 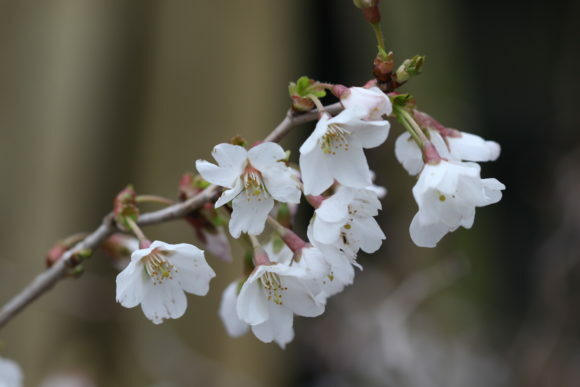 Prunus incisa ‘Kojo-no-mai’ has an eventual height and spread of 1.5m-2.5m. Prunus x subhirtella ‘Pendula Rubra’ is an elegant, weeping cherry tree. In spring, it is covered in an abundance of pink flowers, which are excellent for bees. Its mid-green leaves turn fiery orange and red in the autumn. 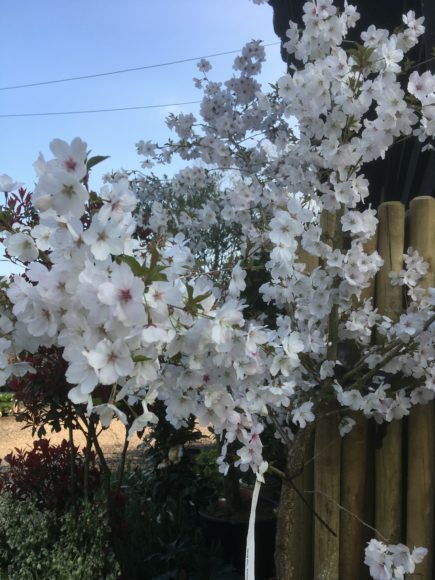 Prunus x subhirtella ‘Pendula Rubra’ has an eventual height and spread of 3m, so is an ideal choice if space is limited. This tree is pollution tolerant. Prunus x hillieri ‘Spire’ is an excellent small, deciduous tree. It has a compact, upright growth habit and is therefore a good contender for a small garden. It produces single light pink flowers in spring. Its young foliage appears bronze in spring, turning green during the summer before becoming red and orange in the autumn. 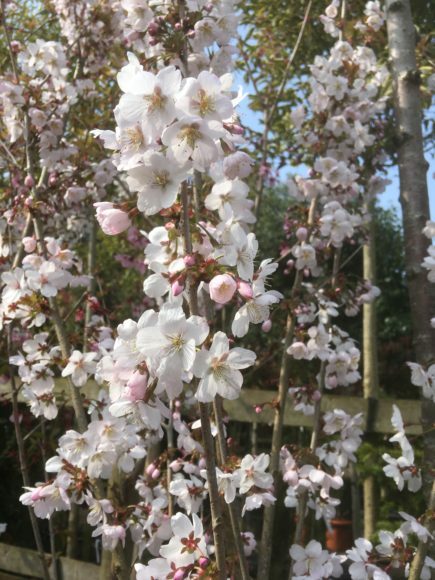 Prunus x hillieri ‘Spire’ can be grown in full sun, in a sheltered or exposed position. It has an eventual height of 8-12m and a spread of 4-8m. 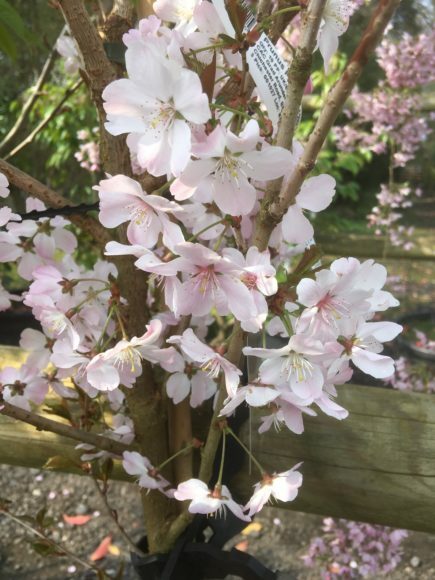 We have an excellent selection of flowering cherry trees in stock that can really enhance your garden or project. We shall look forward to your visit to Arundel Arboretum, where a member of the team will be delighted to show you our stunning range. Or feel free to contact us for anymore information.